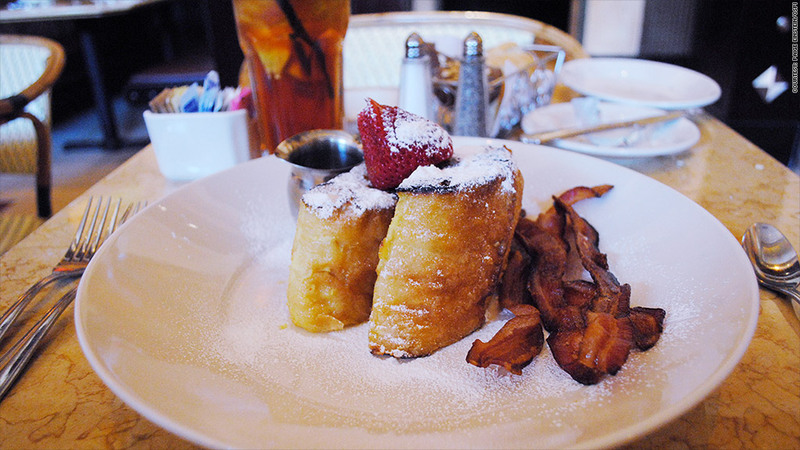 It's not the bacon, but the custard filling that gives The Cheesecake Factory's French toast "almost a full work week's worth" of saturated fat, CSPI said. Warning: These meals are hazardous to your health. Delicious, perhaps, but hazardous. French toast with enough saturated fat to last a week, a burger with more than three days worth of sodium and a stack of seafood with more than a day's worth of calories top this year's Xtreme Eating list of meals at full-service restaurant chains. The list is prepared by the Center for Science in the Public Interest, an advocate for healthy eating and food science. Deserving special recognition is The Cheesecake Factory (CAKE), CSPI said. Three of its menu items appear on the list: the Reese's Peanut Butter Chocolate Cake Cheesecake, Farfalle with Chicken and Roasted Garlic in a cream sauce and a pile of custard-filled French toast. "Would you eat 14 slices of Aunt Jemima frozen Homestyle French Toast stuffed with 2½ (8 oz.) tubs of Kraft Philadelphia Original Cream Cheese Spread? Well, you pretty much just did," CSPI said. Cheesecake Factory noted its "SkinnyLicious Menu" with 50 healthier options. And some customers, it said, are taking a night off from counting carbs. "Many of our guests come in and want to celebrate and not be concerned with calories," said spokeswoman Alethea Rowe. --Red Robin (RRGB)'s Monster burgers, which come with unlimited servings of fries and the option to add a second burger patty. --The Big Slab of spareribs at Famous Dave (DAVE)'s, which weighs in at 1.5 lbs of meat per plate. --The Signature Deep Dish Pizzas at BJ's Restaurants (BJRI), which stacks up to three days' worth of sodium and over 2,100 calories. --Chevys' Super Cinco Combo, a platter with two enchiladas, a taco, a tamale, a fried stuffed pepper, rice, corn pudding and beans. That's the equivalent of 11 Taco Bell tacos, CSPI said. --The Big Hook Up platter from Joe's Crab Shack (run by Ignite Restaurant Group (IRG)), complete with crab balls, fish and chips, coconut shrimp, stuffed shrimp, hushpuppies and coleslaw -- or a day and a half's worth of calories. --The steak at Maggiano's Little Italy (a brand of Brinker International (EAT)) comes with Italian sausage links, potatoes, peppers, mushrooms, roasted onions, sun dried tomatoes, sauce and garlic butter, all for over three days worth of saturated fat. This is CSPI's seventh annual list. Last year, The Cheesecake Factory took two of the nine spots.